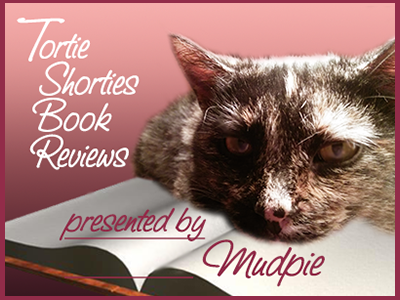 50% Off Gwen Cooper's "My Life in a Cat House" -- 3 Days Only! 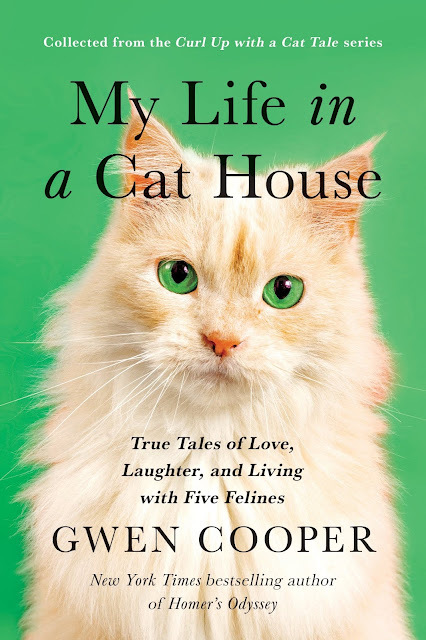 For 3 days only (August 30 through September 1), you can pre-order first-edition hardcover copies of Gwen Cooper's new book My Life in a Cat House for only $11 (50% off the $22 price)! 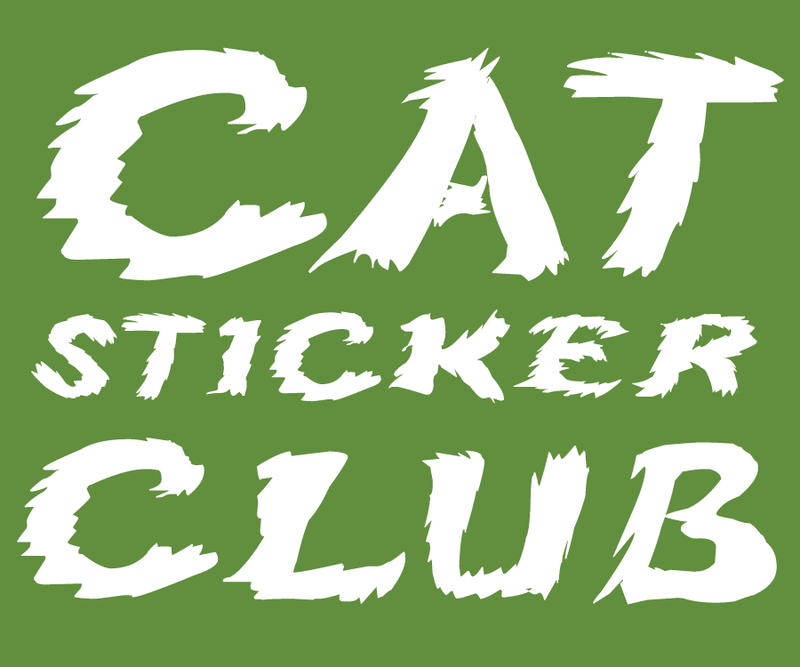 Just click here and use the promotion code 20CATS at check-out. 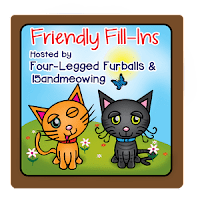 Gwen will be donating 100% of her royalties from all sales during this 3-day sale period to Blind Cat Rescue in Homer the Blind Wonder Cat's name! You can only use the coupon once, but you can use it that one time for as many books as you want! You know you'll want at least one, and with the holidays around the corner, you can't beat an $11 stocking stuffer! Over the weekend I mentioned that I found myself in a bit of trouble recently to where I ended up being threatened with eviction! 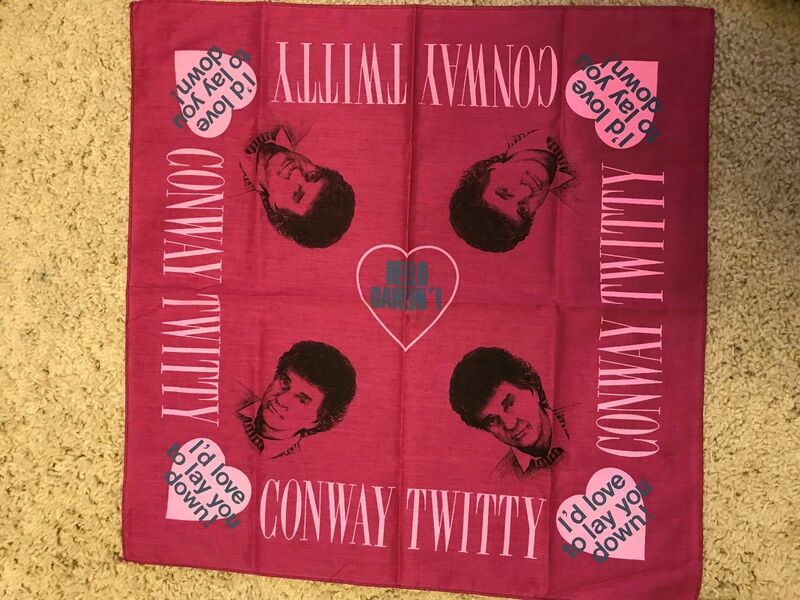 A few of you guessed that it may have had something to do with Mommy's Conway collection, which I find really funny because it's obvious everyone understands where her priorities lie! This summer Mommy bought a portable Victrola record player as an early birthday gift to herself. (Now she's eyeing a Victrola CD player shaped like a jukebox.) 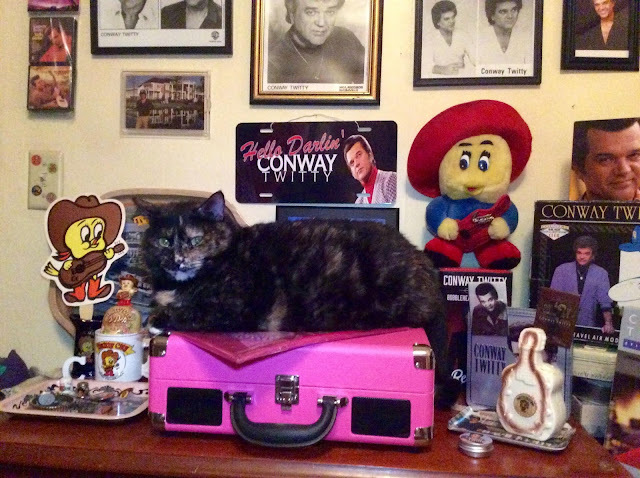 She decided to put it on a bureau in our bedroom surrounded by a bunch of her Conway collectibles and wall of photos. One night last week she was getting ready for bed, heard a noise, and turned around to find this. She didn't yell (much) or try to make me get down out of fear that I would wipe something out (my "wide load" was mentioned), but she wasn't happy and watched me like a hawk. Each day since I've hopped up there and given Mommy heart failure, but she does admit that I'm not a bull in a china shop and I step pretty carefully. Hey, I value my life!!! I think I've come up with a credible story to get me out of trouble though. Did you notice the piece of cloth between me and the record player? It's a scarf that was sold at his concerts with his picture on it and the words I'd Love to Lay You Down, the title of one of his biggest songs. I heard that when he would perform that song in concert women would throw blankets on stage as a not-so-subtle invitation. (Mommy is far from alone in her belief that he was the sexiest man to ever walk the planet.) 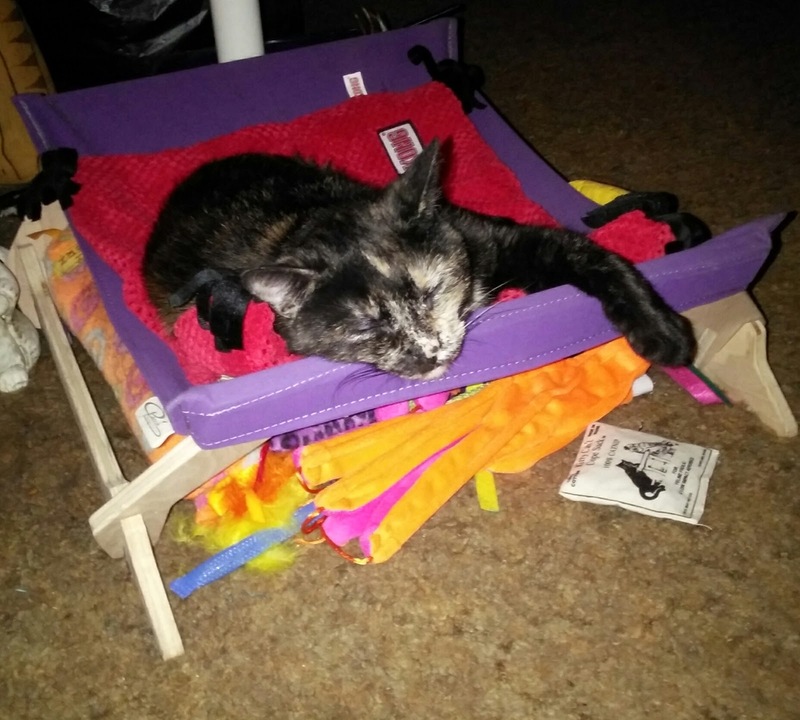 Well, brilliant little tortie that I am, I'm just doing what the scarf says...I'm laying down on it! So for the time being we've arrived at a truce...Mommy lets me do my thing as long as I step very, very carefully. But if anything tragic "happens" to anything in her collection, I still may be looking for some new digs! 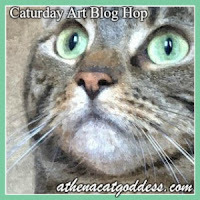 Today is Rainbow Bridge Remembrance Day, a special day created by Deborah Barnes – author, award winning blogger, and cat advocate in tribute to her cat, Mr. Jazz, who she had to say goodbye to on August 28, 2013. She shared the journey of letting him go in her most recent book, “Purr Prints of the Heart: A Cat’s Tale of Life, Death, and Beyond,” a warm and heartfelt book that is written in the wise and comforting voice of Mr. Jazz himself as he shares his life and death journey to offer guidance and understanding through a cat’s perspective as to why sometimes letting a pet go can be the greatest gift you give them. 1) Create a memorial in your home. 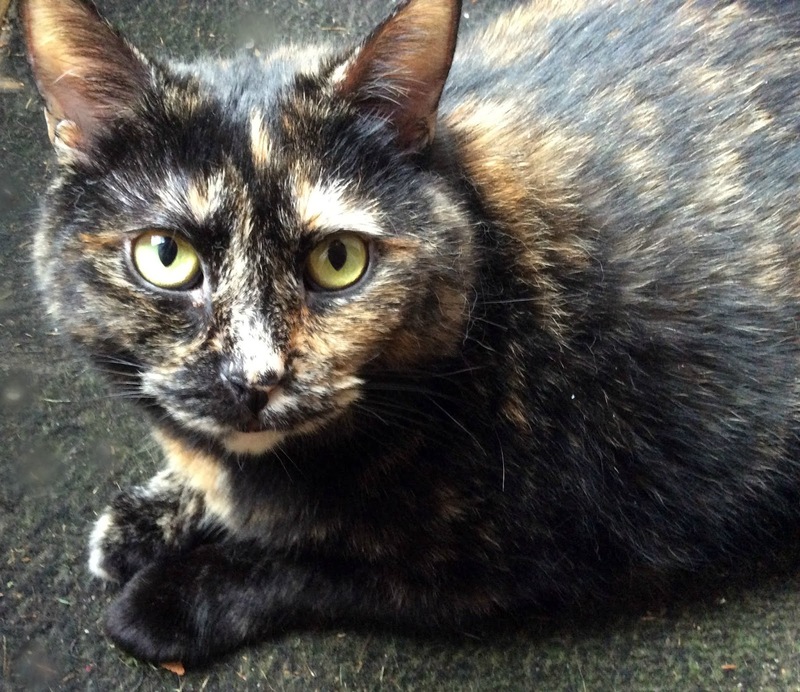 Truffles is the first cat I had cremated because I wanted to keep her close to me always. Her portrait, paw print, various angel statues, and ashes rest on their own special table in the living room. 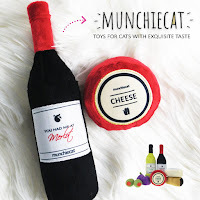 You can also display a few of their favorite toys, their collar, favorite photos and a lock of their fur. A shadow box is a lovely way to preserve and display the items you can't bear to part with after your pet is gone. 2) Start new holiday traditions. 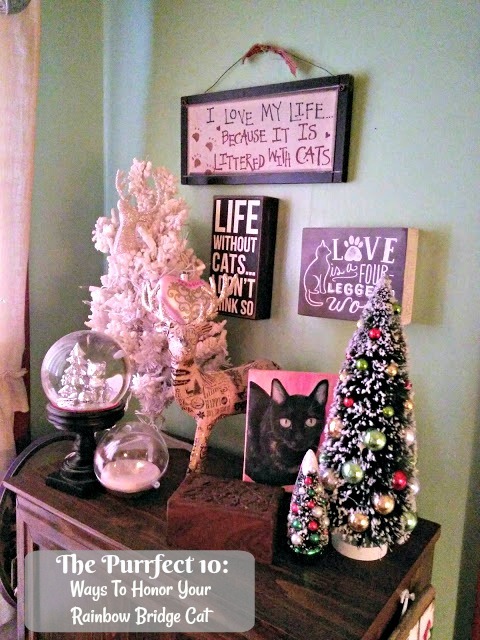 During the holiday season when Truffles' table needs to be moved to make room for the tree I create a Christmas memorial area in another part of the room with her very own small tree and other various decorations. I also have ornaments on my tree that honor all the cats I've shared my life with. If you've saved any of your pet's fur (or if you haven't this is a good tradition to start with your current pet), it can be put inside a clear plastic or glass ornament so they're always watching over you. 3) Create a memorial in your garden. 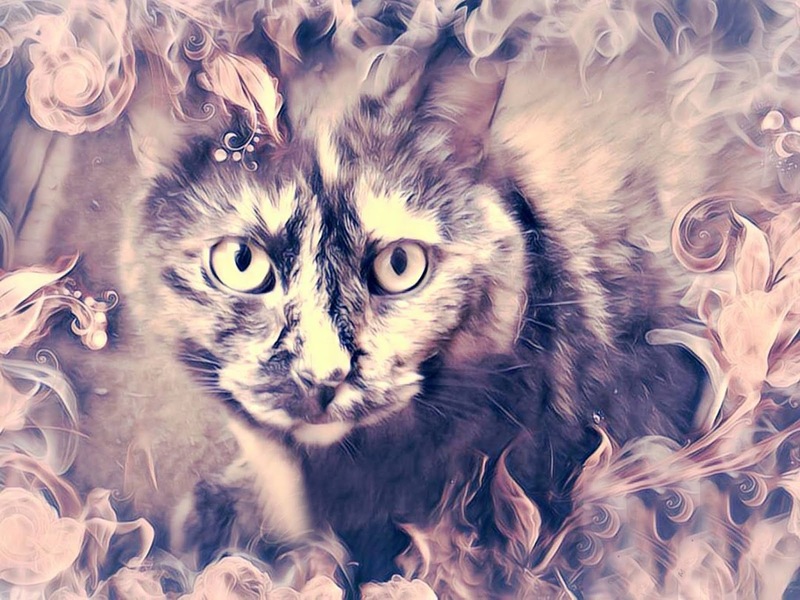 If your cat is buried in your yard, or even if she's not, consider adding an engraved marker or memorial stone with her name on it. A statue of St. Francis (the patron saint of animals), an angel, or even a peaceful water fountain can contribute to a special memory spot outdoors. 4) Donate leftover food and supplies. Every cat in your life is going to have their own personal likes and dislikes just like people do. 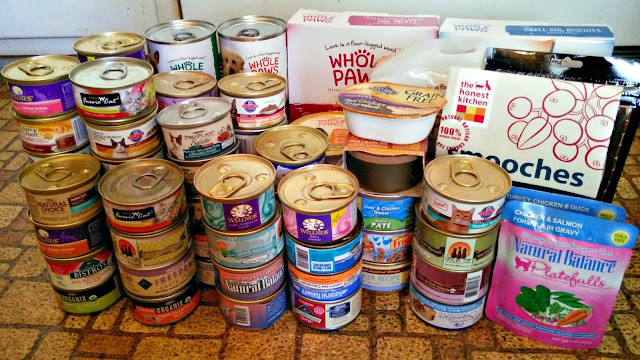 Thanks to long expiration dates on pet food, when Tara passed away I bagged up and set aside her leftover cans of food with the intention of keeping it for the next kitty. 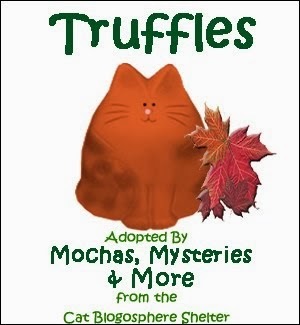 Then Truffles came along and her tastes were very different. So the bag of food sat there. For 14 months. As silly as it seems, I could not let go of that food. It was Tara's. Finally a light bulb went off in my head and I realized that Tara would want that food to be in the tummies of kitties in need. 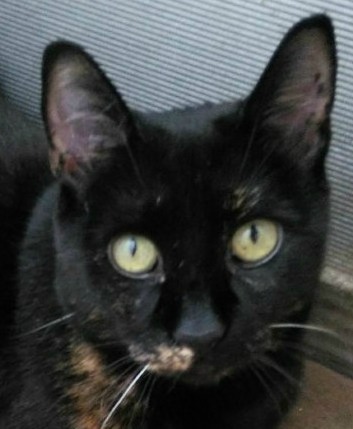 It felt so good to donate that leftover food in Tara's honor, just as it did with the food Truffles left behind after Mudpie came into my life. 5) Commission artwork. Shortly before Truffles ran off for the Bridge I received an unexpected package in the mail from our friends at Chewy.com - a commissioned painting of her as thanks for our work for them as a Chewy Influencer. It meant the world to me then, but even more so after she was gone. There are many artists that specialize in creating memorial paintings for grieving pet parents. 6) Get creative. Whether you draw or paint, write stories or poetry, journal or scrapbook, get your creative juices flowing to honor their memory. Writing about Truffles, both a detailed account of her last day and a short story including all my cats who now reside at the Bridge, was very therapeutic for me. 7) Wear your heart on your sleeve, around your neck, & throughout your home. 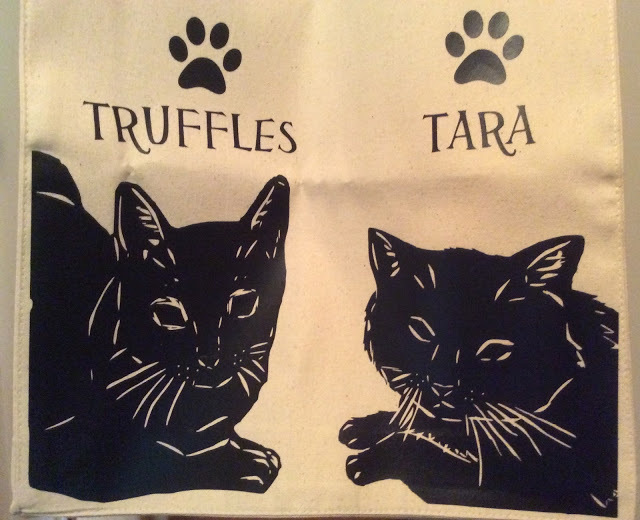 I have Tara and Truffles' images on countless pieces around my home - t-shirts, bracelets, necklaces, blankets, pillows, even a tote bag. Surrounding myself with these one of a kind items that I can see and enjoy on a daily basis brings me such comfort. Today you can even purchase special jewelry made to carry a portion of your pet's ashes, the ultimate way to keep them with you at all times. 8) Organize a supply drive in your cat's name. Shelters are always in need of food, treats, toys, bedding, cleaning supplies, and a multitude of other things. Reach out to those close to you, or even your entire community, for donations so you have a large amount to bring to the shelter in your pet's name. 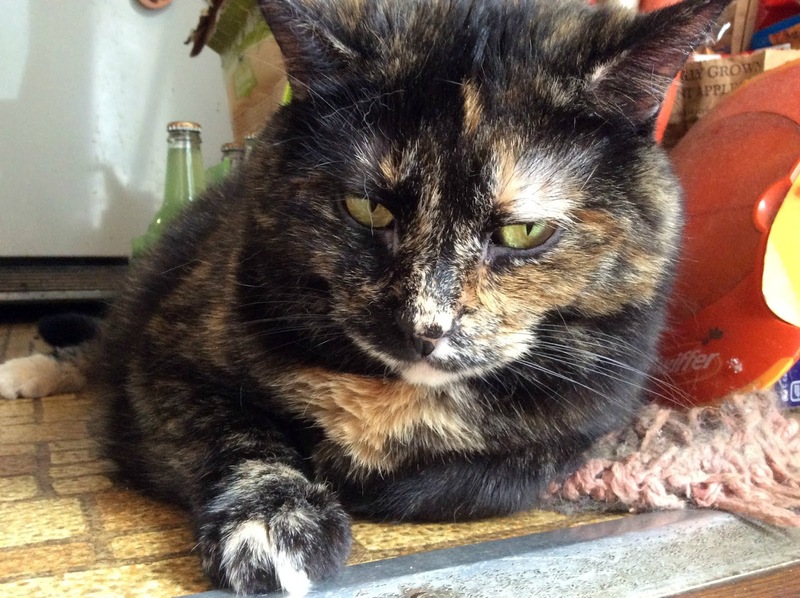 10) Open your heart to another homeless cat. 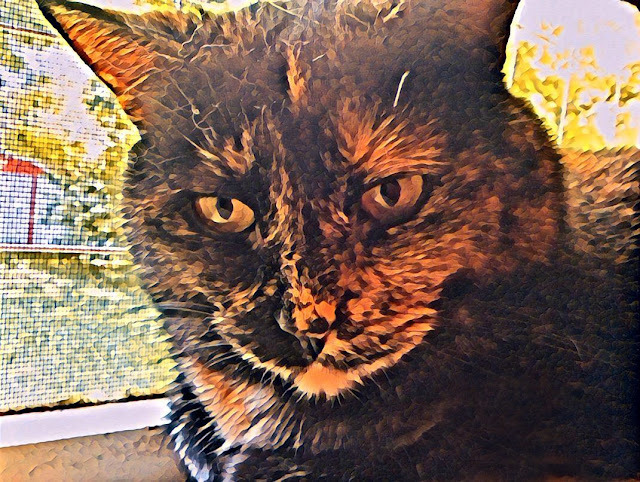 After suffering the loss of a cherished pet it's the easiest thing in the world to say you never want to go through such pain again and decide not to adopt another cat. That's not the way to honor their memory though. Millions of animals are euthanized in this country every year because there aren't enough homes for them. Adopting another cat when the time is right for you will not only save a life but will also help to heal your broken heart. You're not "replacing" the friend you've lost - you're giving another deserving animal the gift of a beautiful life with you. 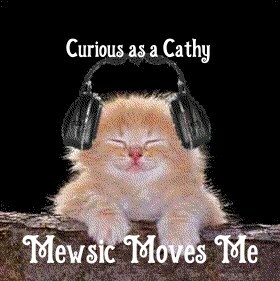 The topic of this week's Mewsic Moves Me blog hop is songs that mention beverages in the title. If that's not a theme tailor-made for country music I don't know what is! 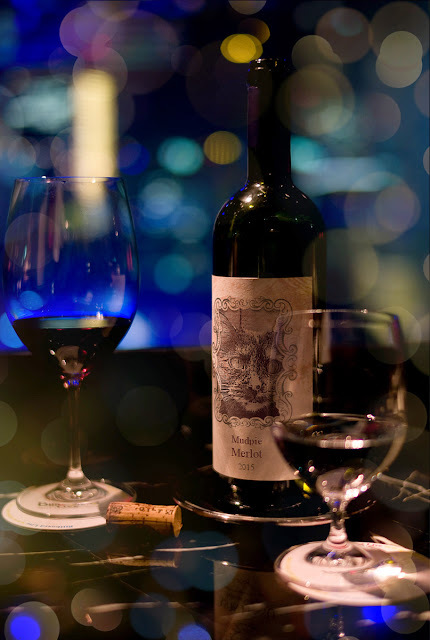 Before we begin, would anyone care for a refreshing glass of Mudpie merlot? While I'm not a huge fan of drinking songs myself, these are all songs I've greatly enjoyed through the years. Next week our freebie topic is all about birthdays, mine and my #1 guy's! We hope you'll join us then! You may think I'm bemoaning the unofficial end of summer with Labor Day right around the corner. Actually, I'm thinking, "Don't let the door hit you on the way out!!! Mommy and I are ready for some cuddle weather!" 1. Cat love brings out the best in me. 2. Summer heat makes me grumpier than Grumpy Cat. 3. 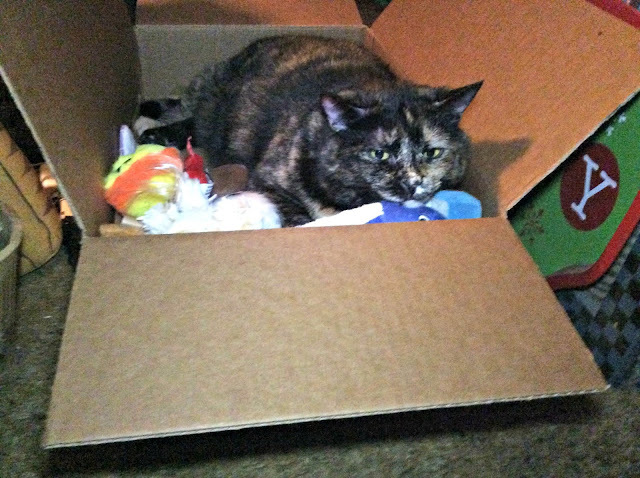 If money grew on trees, I would buy lots of new toys for myself and then donate the rest to help homeless kitties. 4. I have a fear of needing to find a new home. Now I'm sure you're all thinking this is an irrational fear, but believe it or not Mommy threatened me with eviction the other night!!! We'll tell you more about it next week. 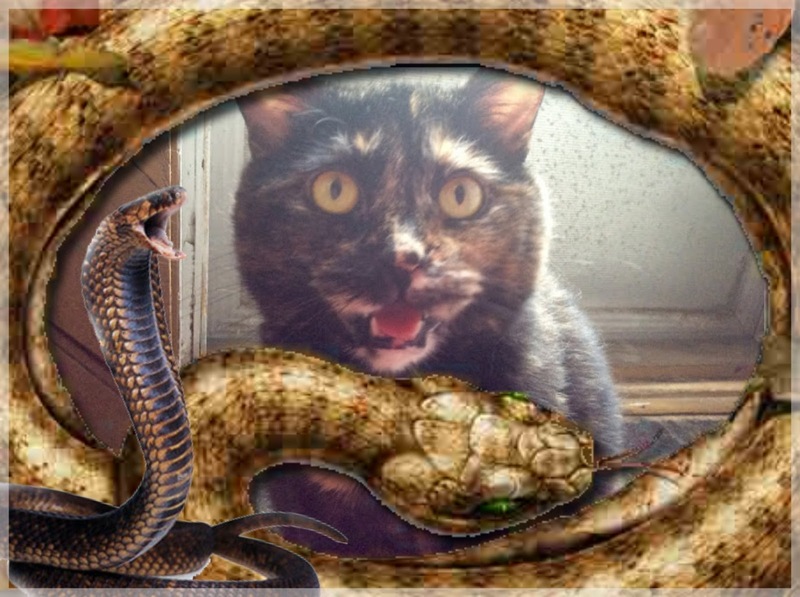 Unfortunately there's photographic evidence of what I did that precipitated the threat...so just in case she's serious, maybe I should ask if anyone has room in their heart and home for this little tortie? I'm going to keep it short and sweet (like me) because I'm sure no one is going to be surprised to hear that I absolutely love this food. 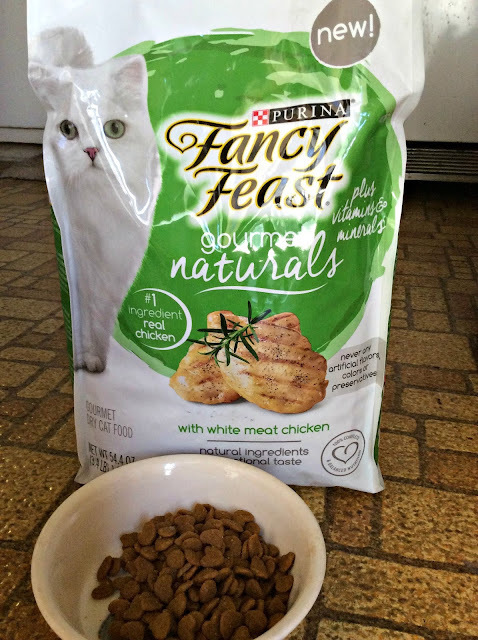 Mommy gives it to me primarily as a treat because I have other foods in rotation for my regular meals, and every time I gobble it right up. 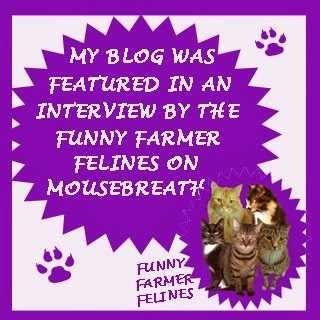 It gets four paws up and a lip-smacking seal of approval from Mudpie!!! 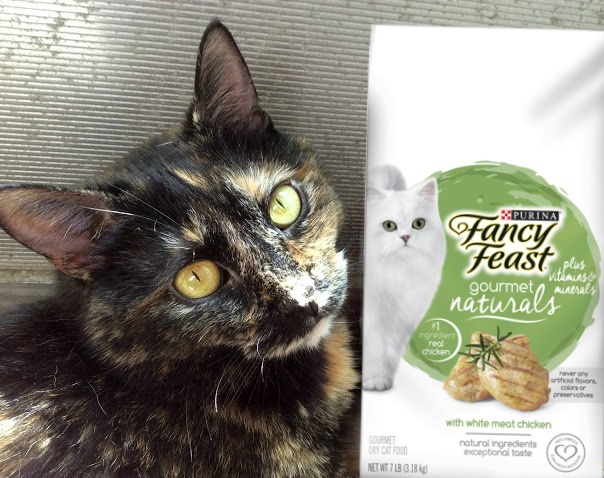 Fancy Feast Gourmet Naturals comes in both white meat chicken (which is what I'm eating) and wild caught ocean fish. 3.4 pound bags are currently on sale for less than $9. Chewy offers FREE 1-2 day shipping for orders over $49, and with over 500 brands in stock they have something sure to make every cat or dog happy. Tell them Mudpie sent you! Last week the theme of the Mewsic Moves Me blog hop was songs with animals in the title, and I lamented the lack of such in Conway's country catalog. After posting, our good friends and fellow music lovers at Stunning Keisha reminded us of one of his duets with Loretta Lynn titled Spiders and Snakes. (Google, why did you fail me?!?!) No matter, because it inspired our theme for this week...snake-related titles! I'll say right up front this is probably the silliest song I've ever heard, and Conway and Loretta rightfully chuckled through most of it. I love it though because it shows what a fun and flirty relationship they had. Conway found his true home and superstardom in country music, but songs like this show he could still rock, even late in his career! Back in the day I used to watch a ton of country music videos on the now defunct TNN (The Nashville Network). This one used to be on a lot. I can't get over the fact that it's been viewed nearly 100 million times on YouTube! Charley Pride is the most successful African-American artist in country music, but this Mel Tillis written song, apparently too intense for country listeners, failed to chart. I had never heard it before doing this search for country songs to fit my snake theme and I really like it. Lastly, for this week only I'm making an exception and veering away from my tradition of only selecting country songs for these posts. Since our friends at Stunning Keisha inspired our theme, here's a song by their favorite band R.E.M. Five years ago today I adopted Truffles. 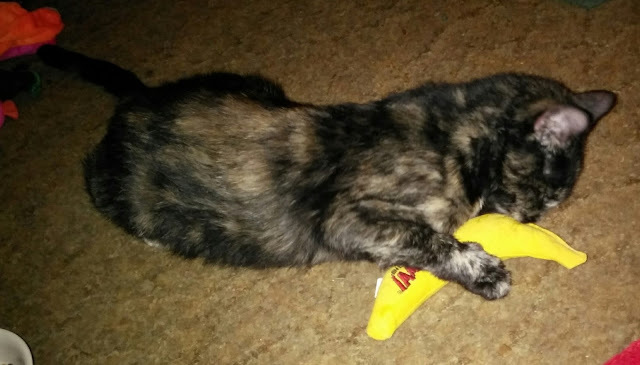 There's no happier day than the day a new fur baby arrives, and I still remember picking her up at Petco, bringing her home and her settling in like she was always meant to be there. She was so young, we were going to have so much time together...but that wasn't meant to be. She's been gone for over 3 years now and I still have a hard time fathoming the little bit of time we had together. 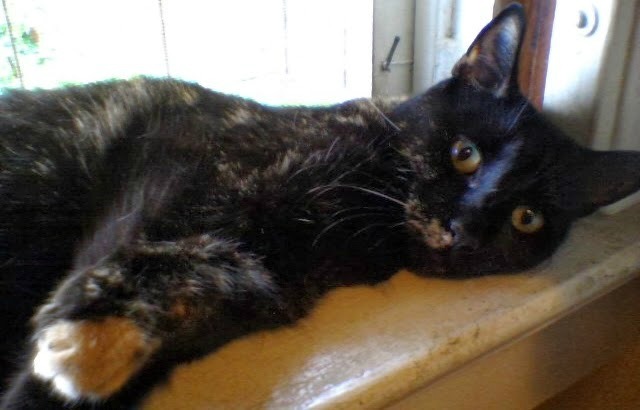 Would I have brought her home that day if I'd known the heartbreak to follow? Without a doubt. 1. I am going to love when fall arrives so I can cuddle in blankies again with Mommy. 2. Once in a blue moon, I eat wet food. It's a sore subject at our house. 3. I want to be more patient. I completely missed the line when it was being handed out. 4. I have a large collection of Conway music. Anyone surprised? Didn't think so. Latest count is close to 80 records, 60 CDs, 40 singles and 30 cassettes. Then there's countless photos, magazines, DVDs, shirts, and other various collectibles. The Conway stuff in my house is only outnumbered by cat stuff! 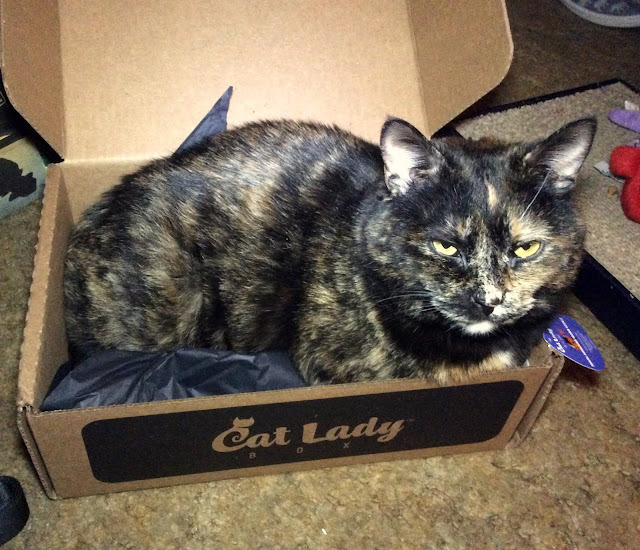 The theme of August's CatLadyBox was "MEOWNOCHROME"...here's what was inside! MEOW Throw Pillows: I need to pick up some pillows so I can use these because they are SO cute and stylish! On Caturdays, We Wear Cat Shirts! 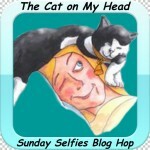 T-shirt: This is probably one of my favorite CLB shirts, but the truth is, I wear cat shirts most days! Kitty Cat Planter: I have a black thumb when it comes to plants so this is going to hold pens on my desk. 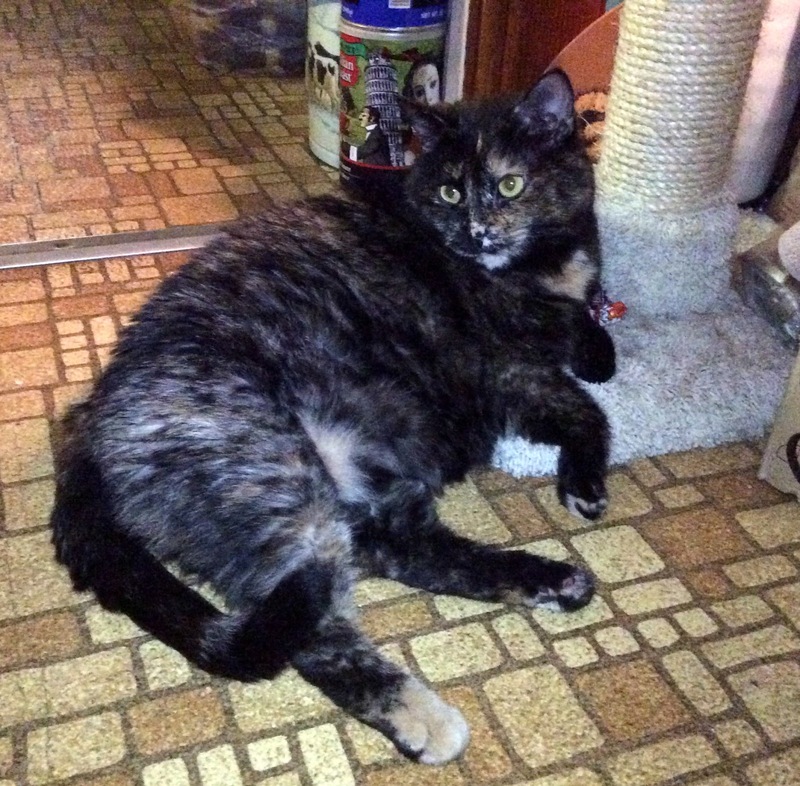 Catnip Fluff Puff Toy: These are Mudpie's favorite kinds of toys to both bop around and use as a soft, furry pillow! 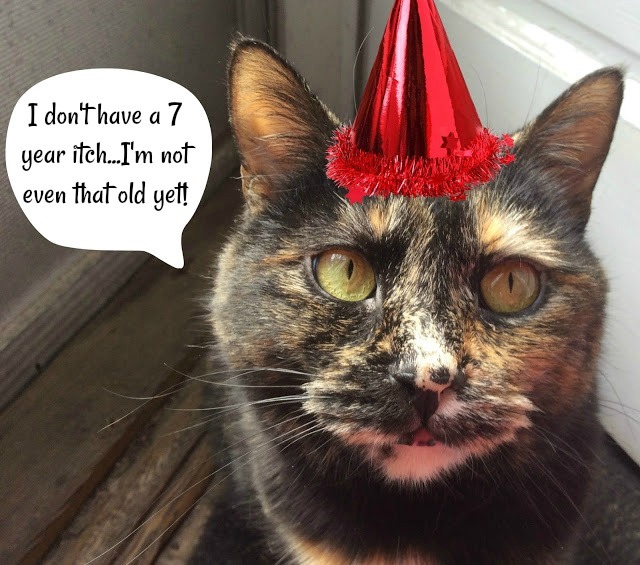 Seven years ago today Mommy started our blog as a way to chronicle her reading life along with a little about her love of cats, but as we're known to do, the kitties took over. 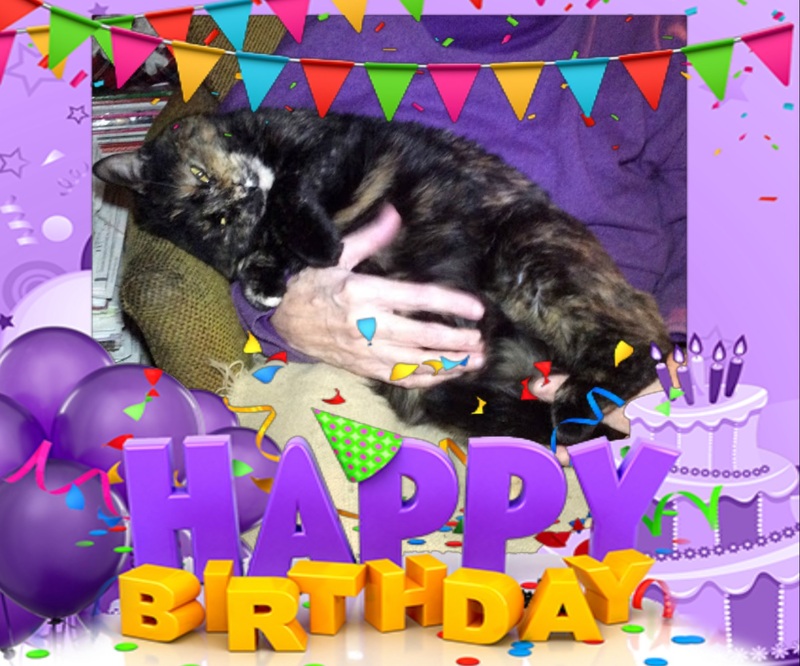 Through Tara, then Truffles, and now little ol' me, our online friends have laughed and cried with us, and created a community of cat lovers that we cherish more every day. The outpouring of love Mommy received following the passing of Tara and Truffles meant more to her than she will ever be able to express, and the welcoming arms you all greeted me with when I arrived...how much luckier can a kitty get than to go from homeless to social media star??? Some stats that astound us: to date we've published over 2,500 blog posts and received nearly 1.5 million page views!!! 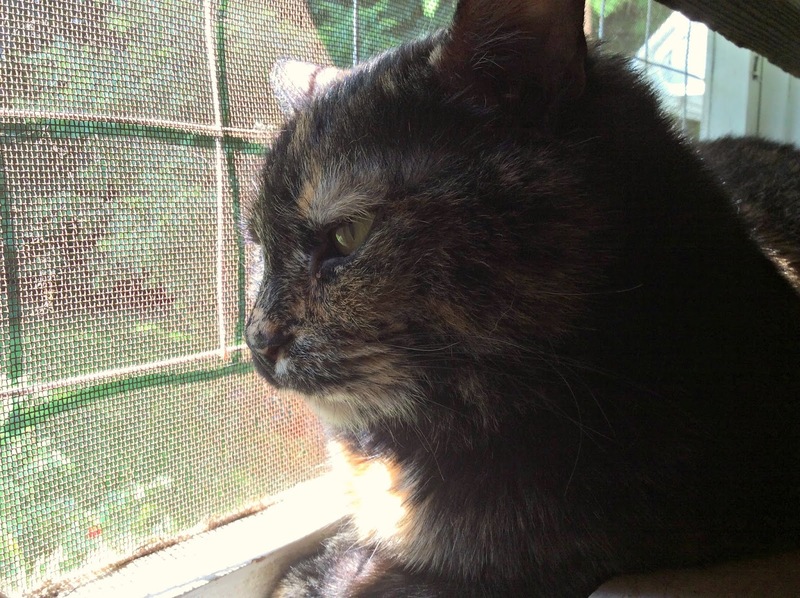 Pet blogging can be hard with way too much sorrow and loss, but in the end the good outweighs the bad. Even after 7 years we (well, Mommy...I haven't even been alive for 7 years!) look forward to sharing our lives with you each day, and if you don't mind maybe we'll stick around for awhile longer? Niptinis for everyone are on the house!!! An egotistical royal cat and his dung beetle sidekick track a jewelry thief in this hilarious new series set in ancient Egypt. 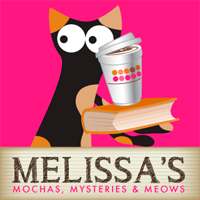 Can a lazy cat and a dung-obsessed beetle really crack a mystery? 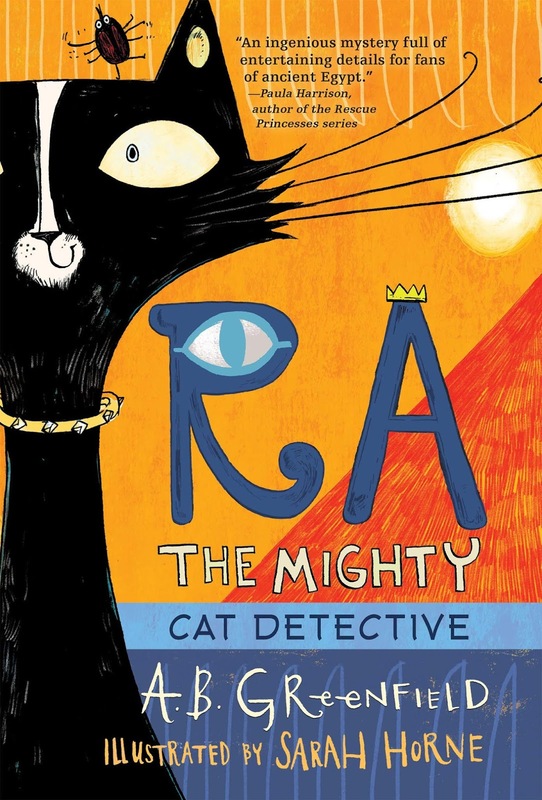 Ra relishes his role as the Pharaoh's beloved—and spoiled—cat. So when an amulet goes missing from the palace, Ra has no interest in solving the mystery. He would rather enjoy his snacks and nap in the warm Egyptian sun. But Ra's friend Khepri, a wise and industrious scarab beetle, insists on investigating in order to save the young servant girl who has been framed for the crime. Once Ra gets going, he decides that being a Great Detective isn't so bad; in fact, he doesn't mind being hailed as “Protector of the Weak and Defender of Justice.” The comically mismatched duo is on the case! A cat and a dung beetle team up to solve a mystery in ancient Egypt - can you think of a more unique and fun way to bring a love of history to children? I became completely entranced in this story from page one and easily could have read it in a single sitting but forced myself to put it down every now and then to make it last! Ra the Pharaoh's Cat lives in the lap of luxury and prefers to do nothing but nap while waiting for his next snack delivery. His best friend is a dung beetle named Khepri whose own personal snack choices obviously disgust Ra, but Khepri is hoping for a bit more excitement in his life. It comes when lovely ladycat Miu asks for their help clearing the name of her friend, a little girl who has been unjustly accused of stealing a valuable amulet and is at risk of being executed. Ra is reluctant to get involved but is finally guilted into assuming the role of Great Detective with Khepri riding shotgun - literally - as his sidekick. While investigating they uncover palace intrigue among both the two and four-legged residents before uncovering the unlikely culprit. I loved everything about this story - the setting, the adorable lead characters, their hilarious banter, and the sweet illustrations by Sarah Horne are just the icing on the cake. I only hope Ra and Khepri have many more adventures ahead of them because I already want to spend more time with the dynamic duo again! Ra the Mighty is feline fun for children of all ages. We've been taking Thursdays off lately but not this week because it's an extra special day at our house! Three years ago today my life changed forever when Mommy decided I was the kitty to fill the empty hole in her heart that Truffles left behind. We've told this story for the past 2 years on my special day, but it's a real life "fairy tail" and I didn't think you'd mind reading it again. I know that I never get tired of telling it! It all began 10 days earlier with a series of photos posted on the shelter website. 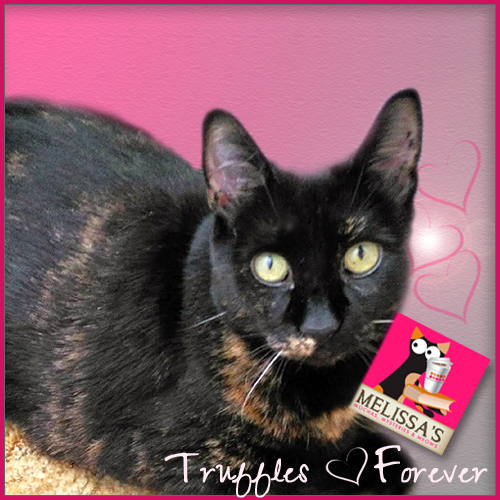 Mommy says she saw my picture and had the same feeling in her heart that she had the first time she saw Truffles. Still, she didn't want to make a hasty decision so she saved my picture to her PC and tablet and kept looking at it over and over. When she finally decided to call the shelter and ask about me it didn't take long for her to decide that I was the one. So on a sunny Sunday morning Mommy and my Grandpa made the hour drive to make our union legal and bring me to my forever home. She had never been to this particular shelter before and thought it was so beautiful. She especially loved the cat quotes on the walls. She enjoyed spending a little time with Thomas, the shelter mascot, but her heart was pounding with anticipation to meet *me*!!! 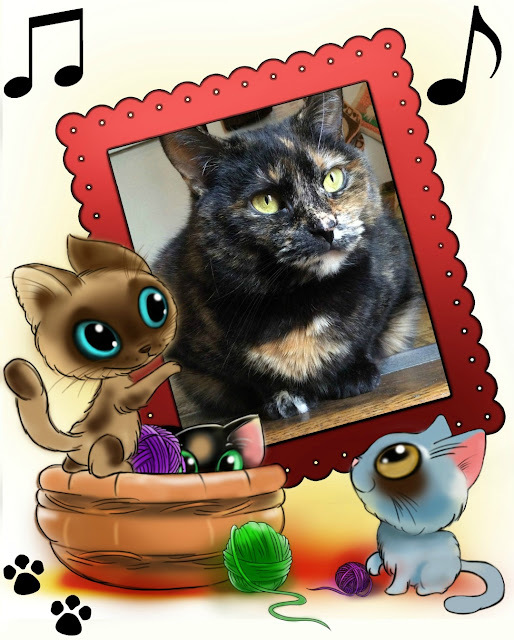 There was a cute little tortie in the front holding room, and at first Mommy thought it was me! 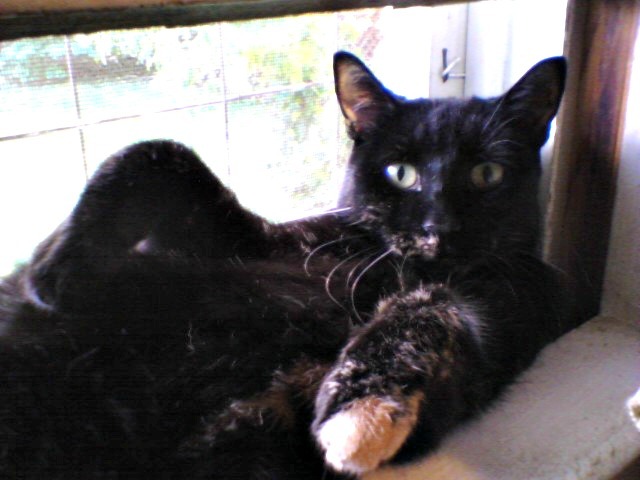 Then she was told that I was sequestered in the shelter director's office because I don't play well with others. Tattletales!!! As soon as Mommy saw me it was all over...I held her heart in my paws! In no time at all the paperwork was complete and I was on my way home. Mommy rode in the back seat with me and I barely made a peep. We just gazed at each other as well fell completely in love. ...and the pawsome cat beds too! (Geez, wasn't I a skinny, scrawny little thing???) I was totally tuckered out at this point! The whole day was just a dream come true, one Mommy and I will never forget. Life is pretty darn amazing for this little tortie today. I have a wonderful family who worships the ground I walk on, and loads of friends in the blogosphere who welcomed me with open arms. Of all the kitties in the world, Mommy picked me. And I thank Cod for her every single day. Do you remember the day you moved to your forever home?